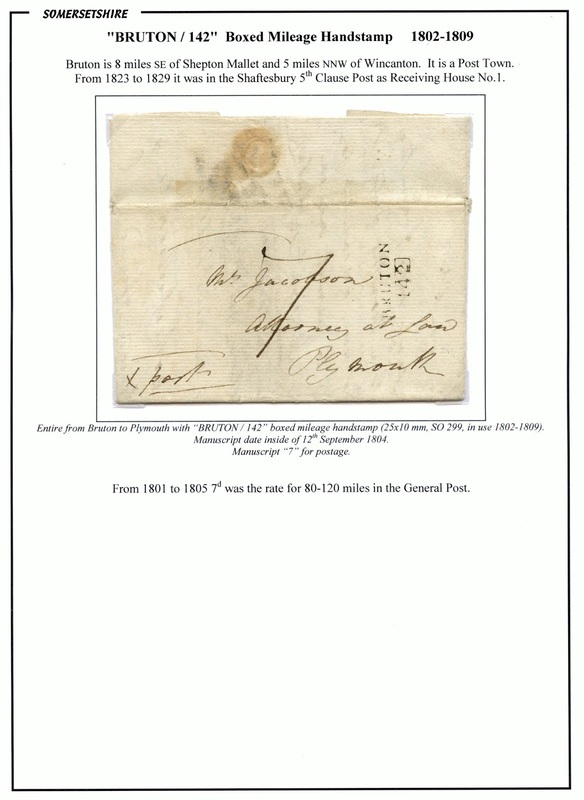 The Wincanton straight line mark shown below is known used from 1801 to 1807. 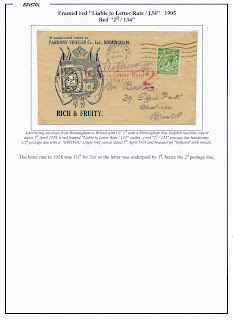 The entire, to Birmingham, is undated apart from "1st July". 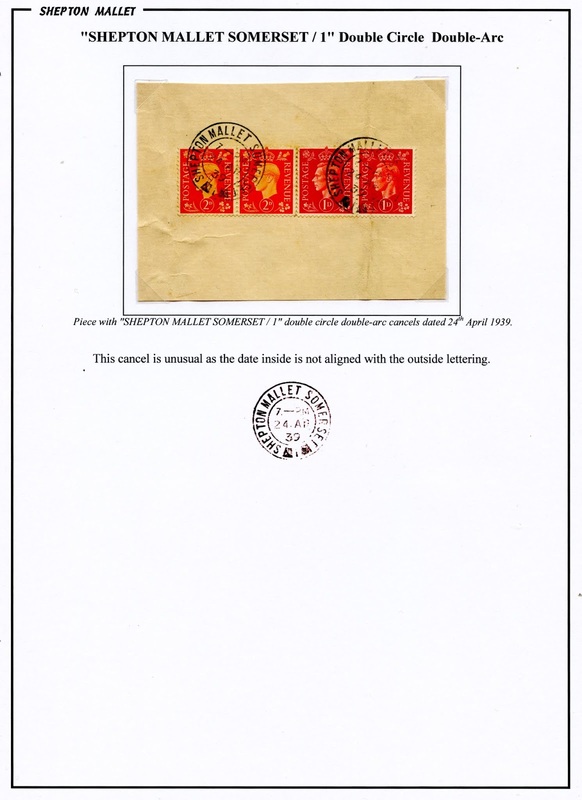 The entire has two postal markings, an "8" crossed out, and a stylised "10" (the spiral). 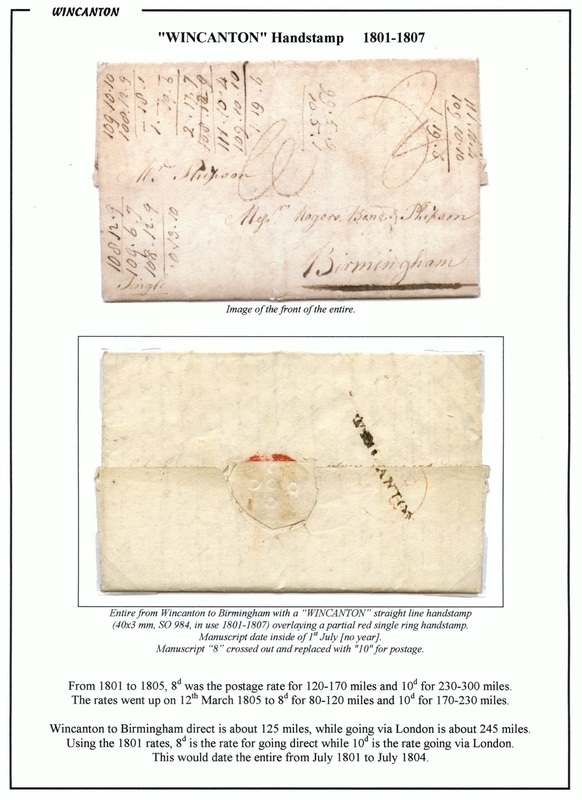 From 1801 to March 1805 8d was the postal rate for 120-170 miles and 10d was the rate for 230-300 miles (on 12th March 1805 the postal rates went up so that 8d was 80-120 miles and 10d was 170-230 miles). Wincanton to Birmingham direct is about 125 miles while going via London is about 245 miles. This fits with the 1801 rates as 8d would be the rate for going direct while 10d would be the rate for going via London. 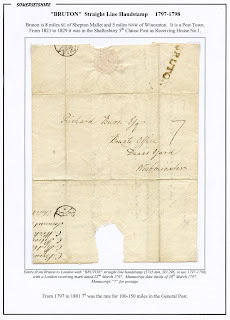 This would date the entire to be from July 1801 to July 1804. 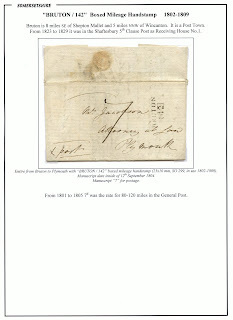 The "BRUTON" straight line handstamp illustrated below is known used in 1797 and 1798. 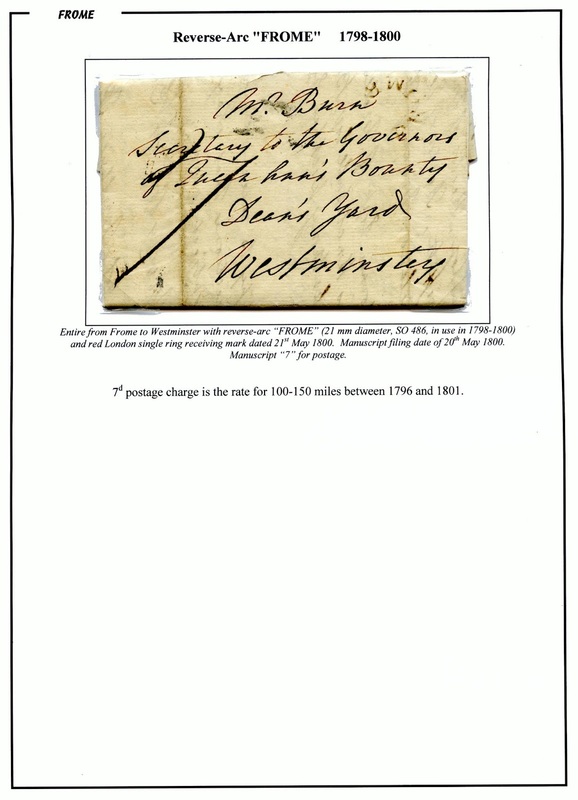 Bruton had a boxed mileage mark "BRUTON / 142" from 1802 to 1809, the example below being from 1804. 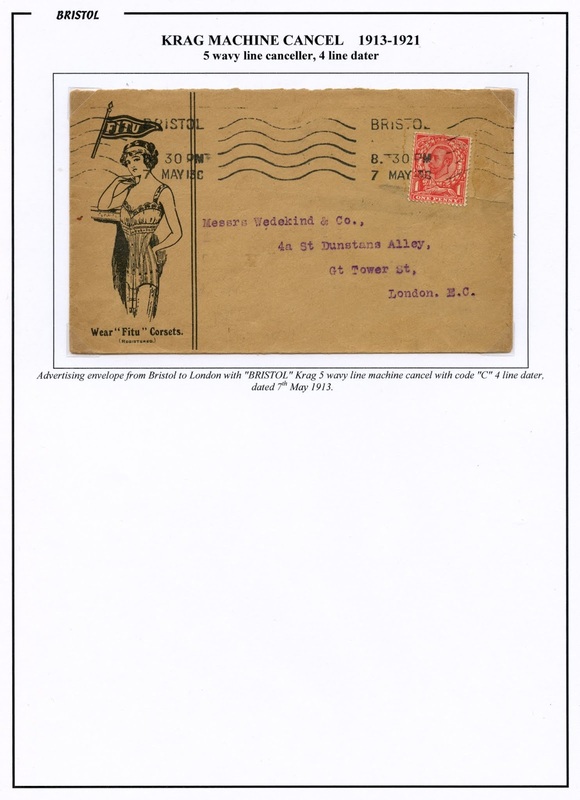 Here are a trio of advertising envelopes, starting with one from Bristol in 1913 advertising 'Fitu' corsets. 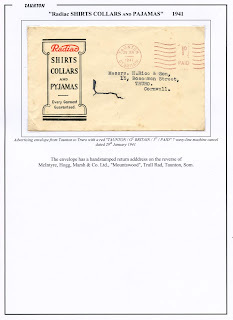 The envelope below advertised Fardon's Vinegar in 1928 - it was sent as printed matter but charged 2d psotage due as it was liable to the letter rate. 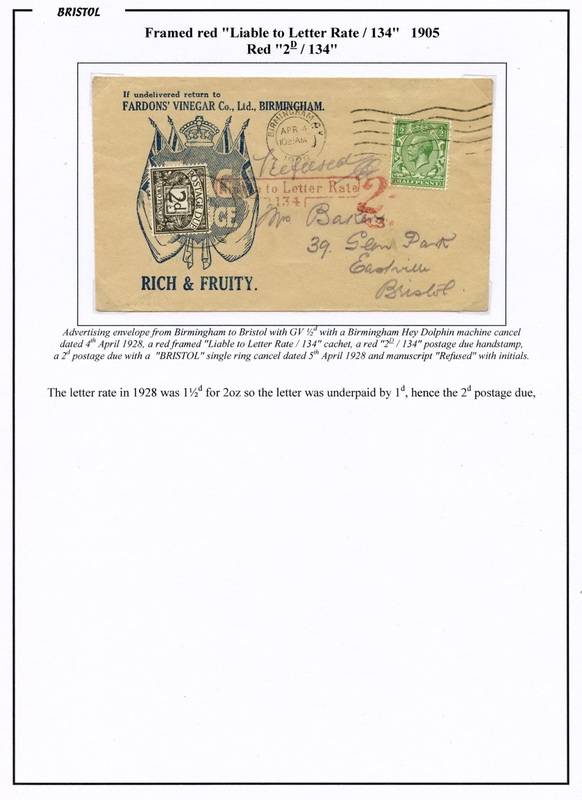 The addressee refused the letter. 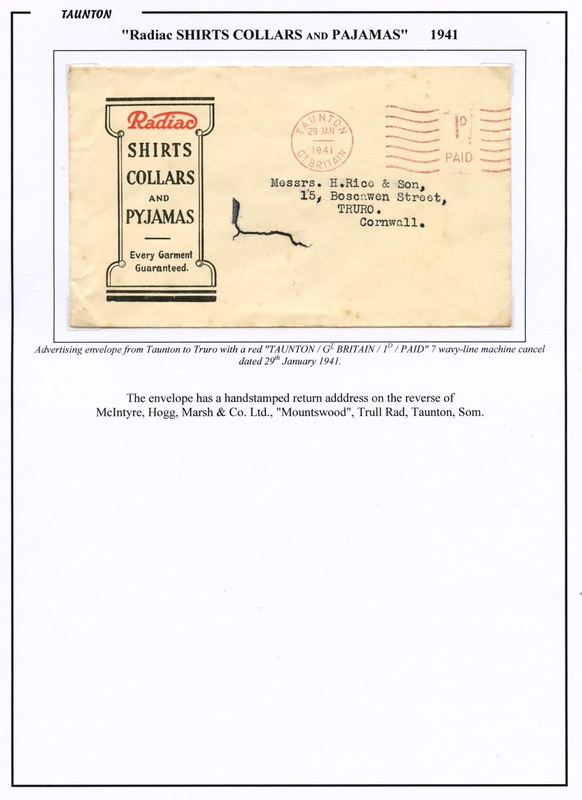 Here is an advertising envelope for Radiac Shirts, Collars and Pyjamas. The firm was taken over and became part of 'Tootal'. 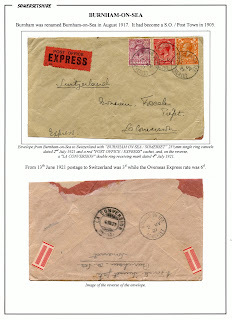 This nice cover below bearing a three colour franking is from Burnham-in-Sea to Switzerland in July 1921. 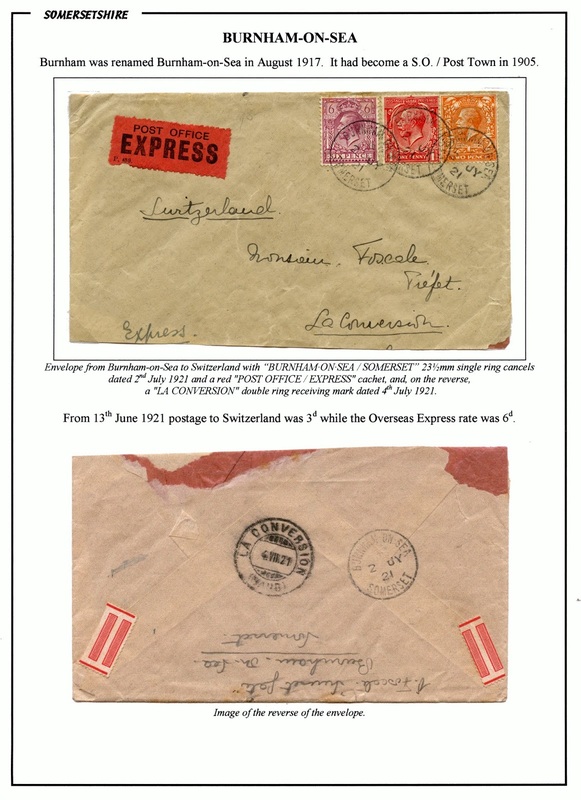 3d paid for the UPU surface mail while the additional 6d paid for the overseas Express service (typically just the delivery from the local delivery office to the addressee. 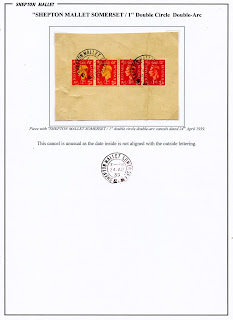 A 'Dulwich' cancel is a double circle double-arc cancel, so called because the first one was issued to Dulwich. 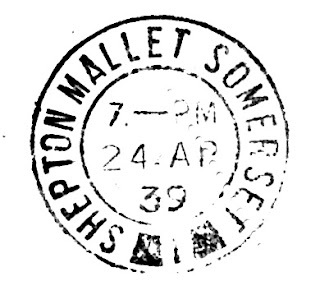 Shepton Mallet has had a number of 'Dulwich' cancels, the earliest type of which were of the form "SHEPTON-MALLET / +" with a maltese cross at the bottom. 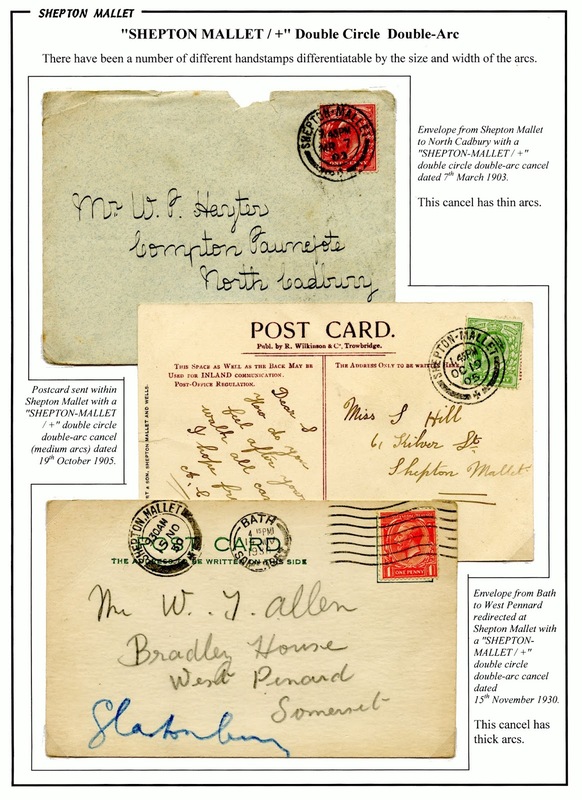 Some of these are illustrated on this first sheet - with examples with thin arcs from 1903, slightly thicker arcs from 1905 and thick arcs from 1930. There are probably more varieties used in the intervening years. This next sheet has a "SHEPTON MALLET SOMERSET / 1" cancel from 1939. 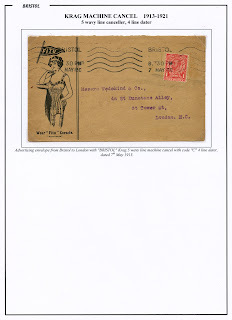 The cancel is slightly unusual as the date inside is not aligned wit the lettering outside. 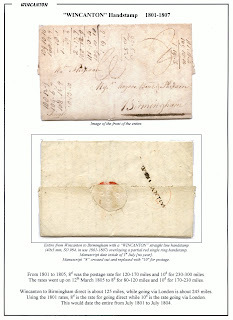 Here are two recently acquired examples of the Cross Penny Post, both from 1835. 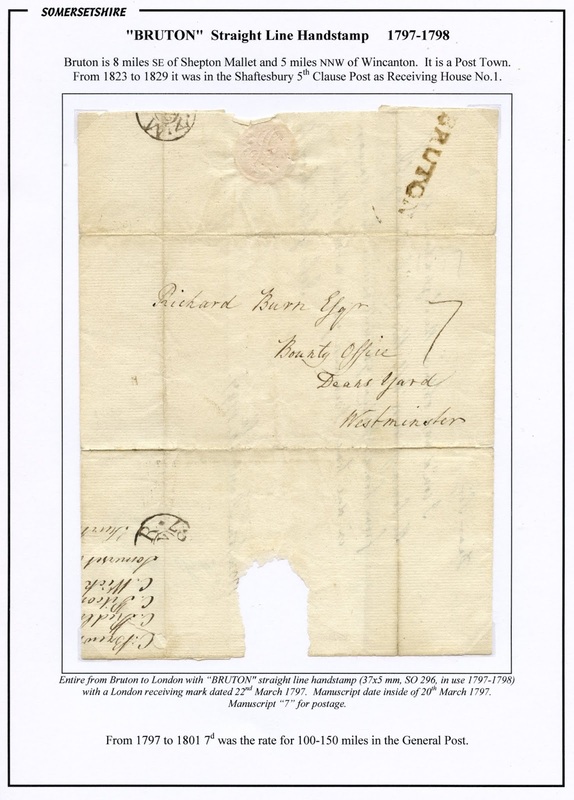 This first one is from August 1835 and is from Weston-super-Mare with a poor boxed "No.2" receiving house handstamp. 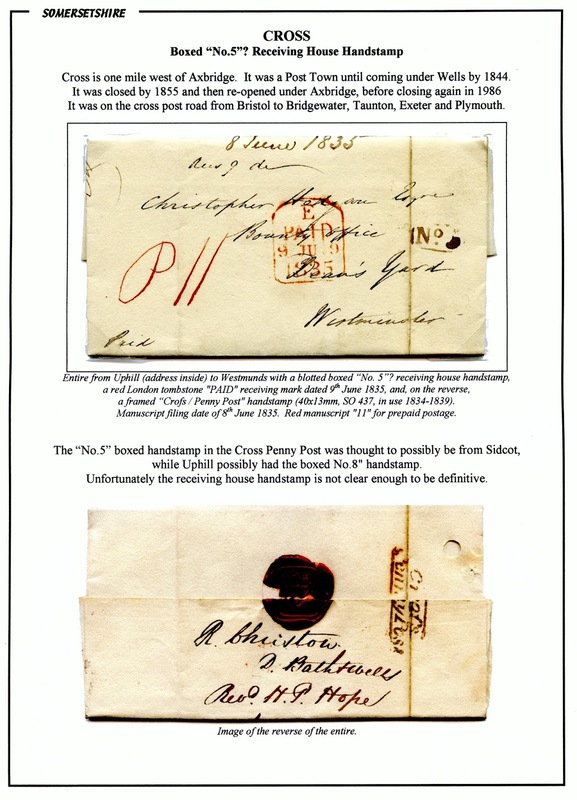 This is one of the more common receiving house marks in the Cross Penny Post. 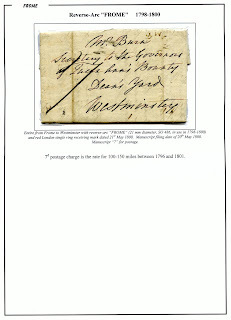 This next example is from June 1835 and was written at Uphill. I think it has a boxed "No.5" receiving house handstamp but it is impossible to be 100% sure because the handstamp was over-inked. 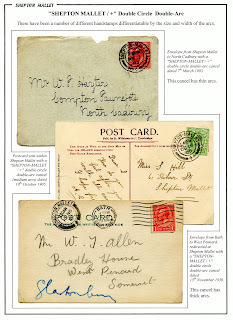 The assignment of some of the receiving house handstamps in the Cross Penny Post is difficult because there are few examples. It was previously thought that "No.5" could be Sidcot and that Uphill could be "No.8" - unfortunately this example is not clear enough to make a definitive statement that Uphill was "No.5". 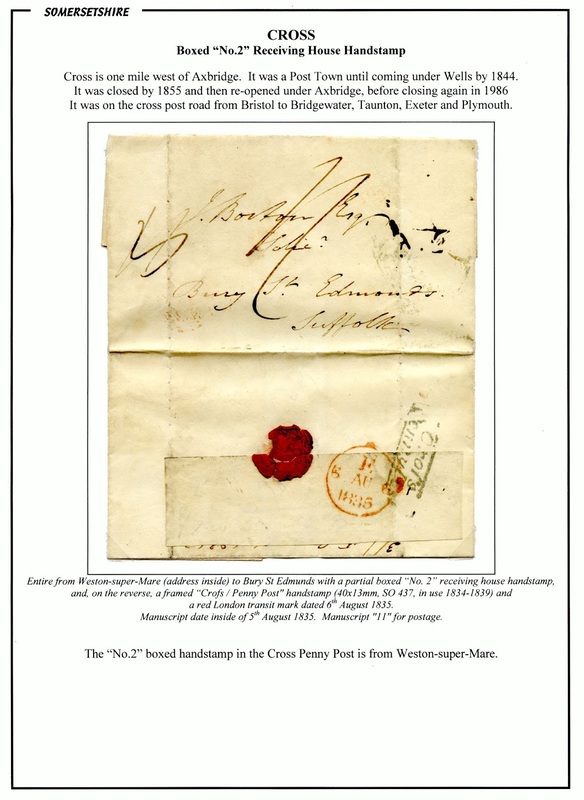 The entire below has a fairly poor example of the reverse-arc "FROME" handstamp, used in May 1800. 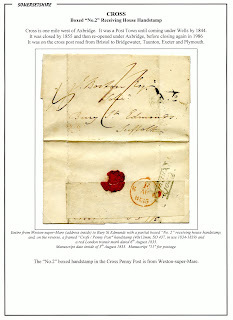 This extends the recorded usage of this handstamp from 1798-1799. 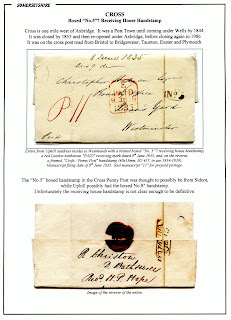 A previous post illustrates a better example of the handstamp from 1799.